Club Atlético de Madrid is a Spanish football team from Madrid, the capital city of Spain, that play in La Liga. They are managed by Diego Simeone and they play their home games at the Wanda Metropolitano. 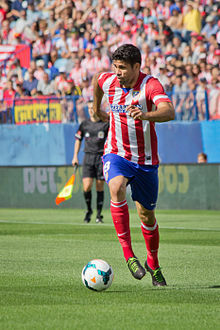 Some famous players that have played there or still do are Fernando Torres, Antoine Griezmann, Koke, Diego Godin, Diego Costa, and Radamel Falcao. In the number of titles, Atlético Madrid is the third most successful club in Spanish football, behind Real Madrid and Barcelona. Real Madrid and Atlético Madrid are city rivals, because both are from Madrid. They compete each year in what is called the Madrid Derby. Until recently, Atlético Madrid had struggled in the derby, carrying a 14-year winless streak into the 2012–13 season. This ended on 17 May 2013 after Atlético beat their city rivals Real Madrid 2–1 at the Santiago Bernabéu Stadium in the final of the 2012-13 Copa del Rey. This page was last changed on 23 September 2018, at 09:09.